The homes of vulnerable teenagers are being taken over by criminal gangs and used to store weapons and carry out drugs deals, police have said. Officers said teenagers as young as 16 were being exploited for their homes - a practice known as "cuckooing". 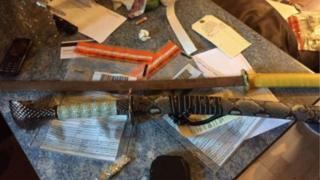 More than 50 arrests have been made in the West Midlands by police investigating one racket, with drugs, stolen cars and Samurai swords seized. Staffordshire Police led the raids, called Operation Yarrow. Supt Scott Jones said 28 were arrested in Stoke-on-Trent and Staffordshire, 14 in the West Mercia and Warwickshire areas, specifically Stratford-upon-Avon, Royal Leamington Spa and Worcester. He said many of those arrested were from larger conurbations, like Birmingham. "This type of criminal activity involves groups operating from large urban areas to smaller towns and using force or coercion on vulnerable members of the community to take over their properties and to distribute drugs," he said. During Operation Yarrow, Supt Jones said he came across vulnerable teenagers aged 16 and 17 whose homes were being used to carry out deals. "These gangs choose victims with a physical or mental vulnerability with their own accommodation," he said. "Lone young women are particularly vulnerable. "The perpetrators might put individuals in the house to live there full time, or spend five or six hours a day there dealing drugs. "Another name for these houses is 'trap-houses' because the victims feel they have no way out. The practice is not widespread but it's certainly becoming more prevalent." During Operation Yarrow, class A and B drugs including cocaine, heroin and cannabis, were seized, as well as knives and Samurai swords. "We won't tolerate this activity in our communities and will do everything we can to prevent the exploitation of vulnerable people," Supt Jones said.